One of the best things to do in Budapest at night is to treat yourself with a Budapest Danube cruise with dinner and live music. The 1.5 hour sightseeing tour on the river Danube is combined with a delicious dinner and live entertainment on board: Sight, lights, live music, delicious dinner! The dinner cruise can be booked with dinner, and without dinner, and there are adult, and student prices too for our special Danube cruise. Our Danube cruises range from cheap Euro 9 boat tours to Euro 69 for VIP cruises on special days. Learn more about the Budapest river cruises or place your booking now. Book your 7pm dinner cruise now via our ticket agency partner. The Danube dinner cruise in the city of Budapest starts at 7 pm (from Monday to Sunday), and we have occasional late night dinner cruises at 10 pm. See the dates below. Book your dinner cruise now to avoid overbooked cruises. Picture the magical night Danube embankment with some of the best sights of Budapest: historical churches, the Buda Castle on the Castle Hill, the majestic neo-Gothic turrets of the Hungarian Parliament, the Statue of Liberty and the Citadel fortification atop the Gellert Hill, the cupolas of the Art Nouveau Gellert Baths, the enchanting facade of the Gresham Palace and the huge domes of the St Istvan Basilica looking over the shoulders of the Gresham Palace. You will be cruising in one of the UNESCO World Heritage sites on our Budapest Danube cruise with dinner. Incredible indeed: most tourists in Budapest are absolutely flabbergasted by the Budapest night views: the charmingly romantic and unforgettably beautiful city lights by night. Depending on your night programme, you can schedule your Budapest river cruise @7pm or @10pm. The prices of the dinner cruises are slightly different as there is no live music on the late night 10 pm dinner cruise. Don’t miss the boat, or the boat tour in Budapest. Locals and tourists alike love the dinner river cruises in Budapest! Book your 10pm dinner cruise now via our ticket agency partner. save Euro 1.8 in the package deal. Booking via our ticket agency partner. save Euro 2.7 in the package deal. Booking via our Hungarian Folk partner. save Euro 2.7 in the package deal. Booking via our ticket agency partner. The Danube dinner cruises in the city of Budapest run on a daily basis from Monday to Sunday at 7pm. The cruise ship leaves from the Chain Bridge (note: the meeting point is not at the Chain Bridge, but in the Danube Palace, a 2 min walk from the river, behind the Gresham Palace). 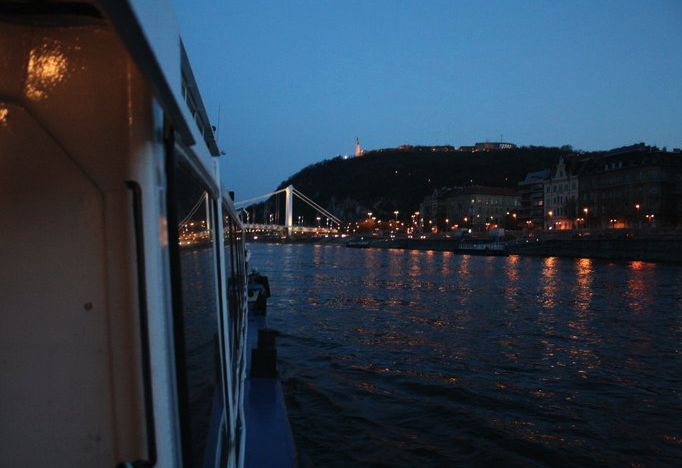 The late night Danube dinner cruises in the city of Budapest start at 10 pm. The 10 pm river cruise runs most days from April to October. In winter time we usually launch the boat tour with dinner once a week. September 2012: 13. 14. 16. 17. 18. 19. 20. 21. 23. 24. 25. 26. 27. 28. 30. October 2012: 1. 2. 3. 4. 5. 7. 8. 9. 10. 11. 12. 14. 15. 16. 17. 18. 19. 21. 23. 25. 27. 30. November 2012: 3. 10. 17. 24. Please note that the 10 pm Danube cruise does not include live music. Accordingly, the river cruise tickets of the 10 pm Danube cruise are a bit cheaper than the highly popular 7 pm cruises (and less packed than the 7pm dinner cruises). We run our 10 pm Danube cruises all year round on certain days (the boats are heated in winter time and cooled with AC in summer time). Note: the late night boat tour is linked to the Hungarian Folk dance shows of the Danube Palace, when many guests would like to finish off the evening with a spectacular night cruise (note: the meeting point is not at the Chain Bridge, but in the Danube Palace or the Budai Vigado Concert Hall, a 2 min walk from the river – your confirmation email will let you know about the details of your booked river cruise and you can also ask further questions or add comments by directly replying to the confirmation email of your order). And the palate: our exquisite Budapest dinner cruises are composed by a gourmet chef (Kloter Gregor Grex, Gault Millau rated Chef). Please see the rich and versatile menu below, which healthily mixes fresh tasty vegetables and high quality meatstoo (our vegetarian guests are also very satisfied, though Budapest is said to be the heaven of meat eaters). Our nostalgia boats (Attila and Europa) will take you on one of the finest dinner experiences in Budapest: the night river cruise is 1.5 hour, and you are guaranteed to enjoy every minute of our 90 minute cruise from the Margaret Island down to the Rakoczi Bridge in the south and back to the Chain Bridge. This well paced boat trip will let you feel the beauty of the night lit Budapest on your skin: the dinner cruise is reported to be the highlight of many tourists’ Budapest visit. If you ask fellow tourists or read dinner cruise reviews, you will hear ‘it was incredible, awesome, fantastic, exciting, romantic, unforgettable’ and most would use the term ‘beautiful’. Beauty indeed. Plus you will have a great dinner (buffet style) and live music! The drinks are included in the price of the river cruises, and if you want to enjoy a candle lit dinner on the boat, you can book a seat for a Dinner too. 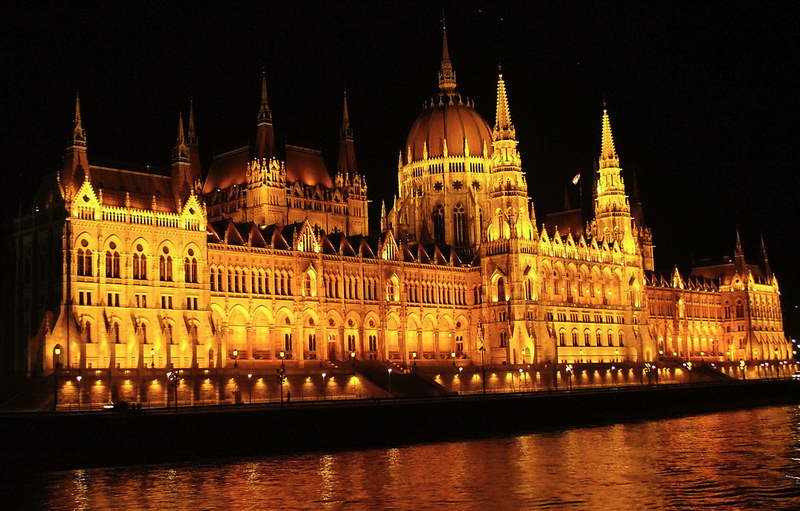 When are the Budapest dinner river cruises? 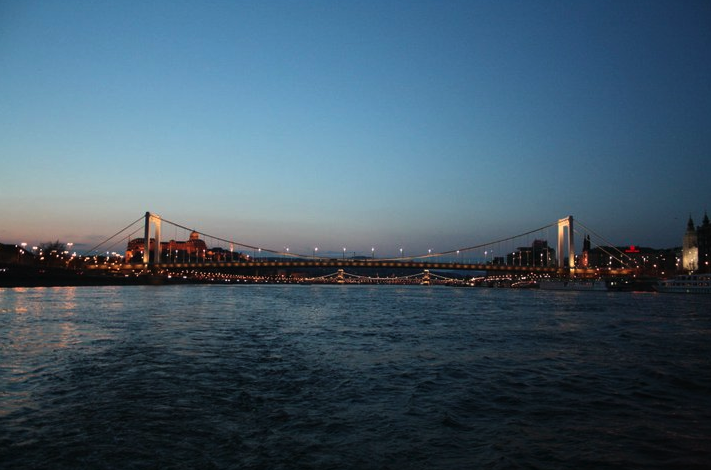 Each night, we run our Budapest dinner river cruise from 7pm to 8.30pm, and some nights from 10 pm to 11:30 pm. Our boats are air conditioned in the summer, and heated in cold weather, so we run our river cruises all year round. The meeting point of the Danube river cruise is close to the Chain Bridge, which you usually see on all postcards, just behind the Gresham Palace (the Art Nouveau palace of the Four Seasons Hotel Budapest). We will meet with our dinner cruise guests at the ticket office of the Duna Palota (Danube Palace) at 5 Zrínyi utca Street, District V. (5th district). 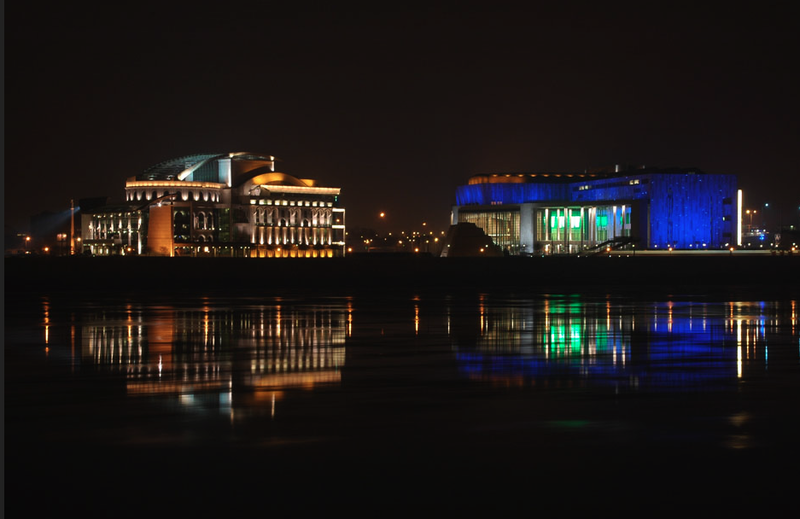 The 10 pm dinner cruises leave either from the Danube Palace or from the Vigado Concert Hall on the Buda side. Please arrive in time for the river cruise at 6.30pm (or 9:30 pm( the latest. See map. How can I book my Budapest night river cruise? Menu – Budapest Danube Dinner & Cruise? Pork slices in garlic sauce in Csongrád style: rich in garlic, the pork cutlets will melt in your mouth. Chicken Breast Paprika: a healthier version of the traditional Hungarian Chicken Paprika (csirkepaprikas) usually made with chicken legs. The Chicken breast makes the paprika stew lighter. Blueberry fruit cream with chocolate sponge cake: healthy blueberries and sweet chocolate – who could resist? The price of the Dinner & Cruise includes a glass of wine (or juice) + 1 bottle of water (0,33) or soft drink. If you are in the mood of drinking more, or clinking with champagne to celebrate and anniversary or birthday, you can buy additional drinks at our Dinner Cruise Drink Bar. Essentially, the music of the Danube dinner cruise is salon music. But who is the live band playing on the Danube dinner cruise? The live music for the romantic night lit views is salon music played by some of the best Hungarian musicians, who are the players of the often world touring Rajko Orchestra (Gypsy Band), including the award winning violinist Zsigmond Vidak (awarded by the Bronze Merit Cross of the Hungarian Republic). I´ll be in Budpest for the end of the year and I´d like to book a dinner cruise for Dec 31.